Imagine if a state legislature voted to “repurpose” a famous painting in an art museum to make it more relevant for the twenty-first century. 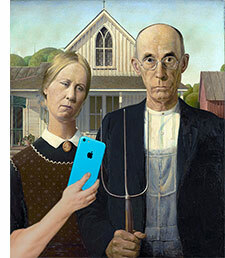 Perhaps something like updating “American Gothic” by painting over it to include iPhones? Or by just removing it altogether from the museum, dismantling the canvas, and sending the pieces off to long-forgotten storage facilities. You can bet that the press would be all over it with righteous indignation. Yet for the past half-century, beautiful works of art have been disappearing at an alarming rate with little protest from the art establishment. Many of the historic dioramas from America’s natural history museums have been lost forever to the march of progress. One of the last great diorama showcases, the Bell Museum in Minnesota, is in grave and imminent danger of this fate. I receive hundreds of emails each week. But when this one came across my screen I felt as though the taxidermy industry needed to hear about this impending crisis. I am sharing the entire text of the email below. The message is from Stephen C. Quinn of the American Museum of Natural History in New York. As the Senior Project Manager for Exhibitions at the museum, he oversees all aspects of new diorama creation including field expeditions, exhibit fabrication, and installation, as well as diorama conservation and restoration. 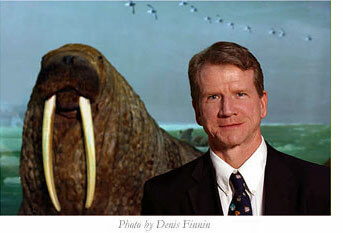 Stephen Quinn is the author of “Windows on Nature: The Great Habitat Dioramas of the American Museum of Natural History” (2006), which is the most definitive book ever published on the museum’s world-renowned dioramas. In it Quinn guides readers through the museum for a dazzling look at nature, science, and art. This richly illustrated volume features vibrantly detailed full-color photographs of more than forty dioramas, rare and never-before-seen historical images from the museum’s archives, and informative, entertaining descriptions of each diorama and its creation. Quinn’s behind-the-scenes tour of these three-dimensional marvels introduces us to an extraordinary group of explorers, naturalists, painters, sculptors, taxidermists, and conservationists whose brilliance, passion, and eccentricities illuminate their creations. Save The James Ford Bell Museum of Natural History! I’m writing to inform you all of some disturbing plans that I have just learned about for the James Ford Bell Museum in Minneapolis, Minnesota. Many of you may know that the Bell Museum possesses what are, arguably, the most magnificent collection of natural history dioramas done by the great wildlife and bird artist, Francis Lee Jaques. Also represented in this priceless diorama collection, are the contributions of Louis Agassiz Fuertes, Robert Bruce Horsefall, Charles Abel Corwin, and pioneer diorama designer, famed Ornithologist and early conservation activist Frank Chapman. Late in his career at AMNH, Jaques assisted in the design of the Bell Museum building to facilitate and assure it’s primary objective of optimum display for it’s dioramas and, through the 40s and into the 50s, designed, directed construction of, and painted the backgrounds for a series of dioramas that can be considered his best. I say this because Jaques was originally from Minnesota, grew up on it’s prairies, north woods boundary waters, and hunted waterfowl on it’s, then, vast and wild wetlands. As they all feature the places that Jaques knew and loved so well, they are infused with his passion and a vitality that is not as apparent (it that’s possible) in his other works. The scenes, actual sites which he and the Bell staff, visited in the wild and slavishly duplicated within the museum, today stand as records of environmental change as they can all be revisited to document habitat loss or preservation. These scenes of thousands of Snow Geese over wind swept marshes, Sandhill Cranes alighting on a spring prairie meadows, or majestic Moose in the northern lake country all evoke such a compelling illusion and sense of place and personal presence that one is struck by the ABSENCE of the cries of the birds or the chill of the north wind on one’s cheek when standing before them. They are masterworks of natural history diorama art! Sadly, I have learned last week that the Minnesota State Legislature has approved funds to build a new natural history museum on the University of Minnesota campus at Saint Paul and this new plan calls for gutting the interior of the Bell Museum in Minneapolis, an attempted removal of some of it’s unique collection of irreplaceable dioramas in order to “reinterpret” some in the new museum, and the possible storage or disposal of the rest. WITH ALL MY HEART, I believe this plan, if acted out, is a grave mistake, and that history will look back on this action as a great and tragic loss – to science, art, and our understanding of ourselves as a species, and how we relate to the natural world around us. Losing this unique building, as a site designed specifically for the display of natural history dioramas, is in itself a monumental loss. But then, to attempt to extract these great works from the alcove settings in which they were specifically designed and fabricated to be viewed in, is a folly and loss for the generations to come that will never see them under those intended conditions. Removed, “re-purposed”, “re-interpreted”, or “re-designed” to become “relevant” and “useful” to today’s University of Minnesota, will inevitably mean that they will find themselves adapted as “open-air”, “immersive”, or “walkthrough” dioramas or placed in configurations that will, undoubtedly, allow for less than ideal viewing or proper lighting. Made to be movable or modular exhibits, they will become even more vulnerable to the whims of ambitious exhibit designers, short-sighted curators, and a nature-deprived public who, with a constant diet for the latest techno/interactive bombardment, cannot begin to understand their value historically, scientifically, or artistically as the remarkable replicas and record of a wilderness they can not comprehend, in this new setting. We need to remind the Bell of it’s original mission in promoting the wilds of Minnesota through it’s display of it’s dioramas, it’s possession of a unique architectural setting designed for their display, as well as their possession of, not just any dioramas, but Jaques own dioramas. What they possess, surpasses anything they could possibly design by removing them from their unique building, created for their display, and then patching them back together and repurposing them to tell some forced University or contemporary research or environmental story that they were never intended to tell as part of their original created mission. The Bell Museum’s magnificent snow goose diorama by Francis Lee Jaques is without equal, yet in grave danger. The Bell dioramas were never created to promote some limiting university goal, but a much more universal and meaningful mission to serve all of the people of Minnesota, and the WORLD. The Bell’s magnificent Snow Goose diorama, for example, is NOT and NEVER will be about the University of Minnesota or it’s research goals. 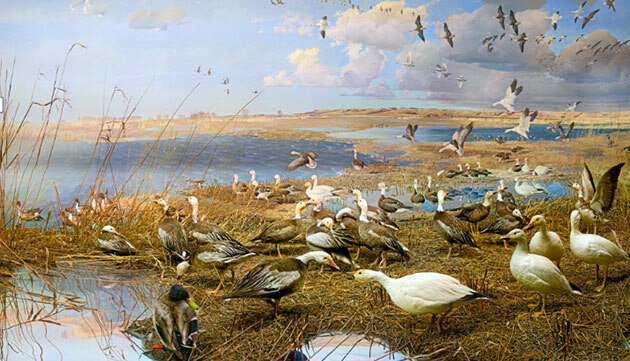 It will ALWAYS be about opening museum visitor’s minds, eyes, and (most importantly) HEARTS to the majesty, wonder, and magnificence of Minnesota’s waterfowl by THE VERY BEST diorama artist capable of pulling it off!!! There will NEVER, EVER be another Snow Goose diorama like that ever made again, because there is NO artist who will ever live again, who knew the birds, understood their behavior, and passionately loved Minnesota, like Francis Lee Jaques. The James Ford Bell Museum is THE ONLY remaining building in NORTH AMERICA that was specifically designed, in it’s entirety, as a standing theater for natural history dioramas. It’s very exterior structure; site plan and interior floor plan reflect this. It is superbly, and perfectly “fine-tuned” for this purpose. There are NO OTHER buildings like it in the US or Canada!!! As such, it is just as significant, both architecturally and artistically, as the Biological Museum of Gustaf Kolthoff and Bruno Liljefors in Stockholm, Sweden, and the grand Akeley Hall of African Mammals or the magnificent Hall of North American Mammals (also designed by Jaques) in the American Museum of Natural History in New York. All of these installations, the Bell among them, will stand through time as great scientific and artistic endeavors and achievements emblematic of a time of awakening to the needs for wildlife and wilderness conservation. Art historians will, inevitably, document these unique art forms as compelling, and masterful illusionistic renderings of nature, done with many of the same intentions, though more scientific in discipline, as the Hudson River School in rendering the “sublime” in the natural world around us. They were all created by the great naturalists/artists/ scientists and educators of their time, requiring extensive and costly travel and expeditions, unique and groundbreaking fabrication techniques, and embraced a mission to present an illusion of nature so powerful and compelling that, it can be argued, they will NEVER be equaled again. There will NEVER be another naturalist/artist and diorama designer like Francis Lee Jaques. These exhibits exist now, as do their real counterparts in the natural world, not to be partitioned, carved up, divided and made to perform, but stand as majestic marvels and portals to evoke a more humble and reverential view of the natural world that demands from each of us, acknowledgments of the profound and priceless value of wilderness and the value of the countless living things that thrive in it. from happening at the Bell, and, in so doing, send a clear message to the museum world regarding the value of all of the great diorama halls that remain untouched and intact. We need to generate a TIDAL WAVE of support to stop this threat to the James Ford Bell Museum building as a landmark structure in the history of American environmental education and wildlife conservation and put an end to plans that would seek to cut up and remove it’s priceless permanent exhibit installations that were never fabricated of materials intended to be moved and repositioned or reconfigured. We need to make the scientific and art world know that the James Ford Bell Museum of Natural History stands, with it’s wonderful dioramas intact, as an irreplaceable treasure of art and science, not just for the people of Minnesota, but for us all. As time goes on, and these dioramas, inevitably, receive the recognition as the wonders of art and science that they truly are, I am certain this fact will grow in evidence, and those who fought to save the Bell will be hallowed as it’s wise stewards. Ten years ago, I was asked to advise, as part of a team, on the possibility of moving these wonderful exhibits. We were told then that the plan was “absolute and firm”, so I committed to offer whatever I could to assure that, if it did ever happen, it would happen in a way that assured the best possible results. But, honestly, I do NOT believe that is possible. I have personally worked on the dioramas at the American Museum of Natural History for nearly 40 years. Many of these were executed by the famed Francis Lee Jaques and are the same vintage and, therefore, are made of the same materials as those at the Bell. They are all built to be PERMANENT installations and NOT intended to be moved. They are ALL designed and built, fabricated, painted and lit, within the theater-like viewing cases and exhibition halls in which they were PERMANENTLY installed. They are intended to be viewed under those specific and controlled surroundings. I can state, with COMPLETE confidence and without a doubt that, they CAN NOT be removed and relocated without gravely endangering or compromising them. The only collection of Jaques dioramas that are still in existence, that come anywhere close to the Bell’s, are those in the Hall of Oceanic Birds in the Whitney Wing at the American Museum of Natural History. This exhibition hall, referred to by the great Frank Chapman as the “Crown Jewel” of the AMNH Ornithology Department, features specimens collected during the 10-year Whitney South Sea Expedition and features exact sites from all of the regions touched by the Pacific Ocean. This grand hall has been poorly served by the AMNH in recent years by having an “additional admission required” butterfly exhibit inserted inside it for over a decade. This treatment makes protecting the Bell Museum dioramas all the more important. When funding for this project was cut ten years ago, I was relieved and thought this terrible plan for the Bell went away. Now that the threat is back, I feel now, more than ever, that the Bell, as a unique building designed specifically as a “Natural History Theater” and all of it’s contained dioramas MUST be preserved intact for future generations. The University of Minnesota should, by all means, design a new and glorious natural history museum in Saint Paul, but DO NOT destroy a state, national and, I would insist, global resource of great value, in the process. We MUST all spread the news of this impending tragedy with a letter-writing campaign to the critical individuals involved. Expressions of concern must be sent from key noted authorities in the field, as well as from the years of annual visitors to the Bell, who love these dioramas as their own. Urging should be for a new University Natural History Museum but not at the expense of the Bell. The threat to that building and those dioramas needs to be clearly known and it’s loss clearly recognized and understood by all who are making this decision. Notably, only partial funding has been raised by the Minnesota Legislature. I am concerned that, in the future, with the changing winds of politics, a less favorable elected legislature will deny further funding after demolition or removal of the Jaques dioramas has begun. Were this to happen, the Bell and it’s dioramas would be irreversibly damaged or, at the very least, compromised, and may never be utilized after all. Also, notably, I have learned that the University, itself, does not view the dioramas favorably, but sees them as “archaic and old” and does not consider them a priority in the plans for their future museum, and would prefer not to address them at all. What is to prevent the University from, in the future, allocating funds away from the dioramas, sighting the VERY high costs for the proper removal, conservation, and reconstruction of these dioramas as not worth it? Also, after these dioramas are cut-up, removed, and reconfigured in their new settings, because of the nature of their original construction as heavy and not easily moved exhibits and less modular, they may start to rapidly deteriorate, since their original fabrication materials (plaster, wax, mache, etc.) was never intended to take the stresses of being moved and reconfigured, and require costly maintenance in their new open display settings, and look further inferior due to less than ideal lighting because they are no longer in their original theater-like settings. In a relatively short time, they are likely to be considered diminished in value and therefore disposed of. PLEASE help me to do EVERYTHING we can to keep this terrible plan from happening and protect these treasures of art and science for future generations. Feel free to forward this message and spread the word to all you feel may share our concerns and be moved to take action.